Pressure Cooker Risotto is one of my favorite things to make in my Instant Pot! 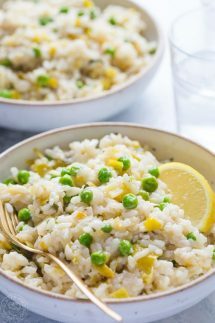 My latest recipe for Pressure Cooker Risotto with Leeks, Peas, and Lemon is a light and easy risotto to make but still has that comforting creamy risotto taste you love! I was never very good at making stove top risotto as I found that I would cook, stir, and evaporate all the broth but my rice was still crunchy and undercooked! All that standing and stirring and I still couldn’t make it work. Before I got my Instant Pot, I think the last time I made risotto was at least five years ago and at that time I’d found a recipe to make it in the oven, which was easier than on the stove, but definitely not as easy as pressure cooker risotto which has it cooked in about 10 – 15 minutes from start to finish. Do measure the rice and liquid as stated in the recipe, the other ingredients you can flex a little on but the liquid to rice ratio if perfect for the Instant Pot and will help give it a creamy texture you love. It’s really easy to make this vegetarian by subbing the chicken broth for vegetable broth, it will still taste fantastic. If I have time I love to make homemade chicken broth which makes the best risotto ever, you need to try it at least once! Use either fresh or frozen green peas, do not used canned as they are salted and are mushy and just not great for this recipe. You may need to cook the rice on the saute setting just for 1-3 minutes to reduce the liquid further after you open the lid of your pressure cooker, it really shouldn’t take very long but just be careful the rice does not start to stick to the pot. Can you make Risotto with White rice? The short answer is no, you can’t make risotto with long grain white rice, it simply won’t cook up in the same way as it’s not as very starchy and it’s better suited for making pilaf than risotto. Which Rice is best for Risotto? 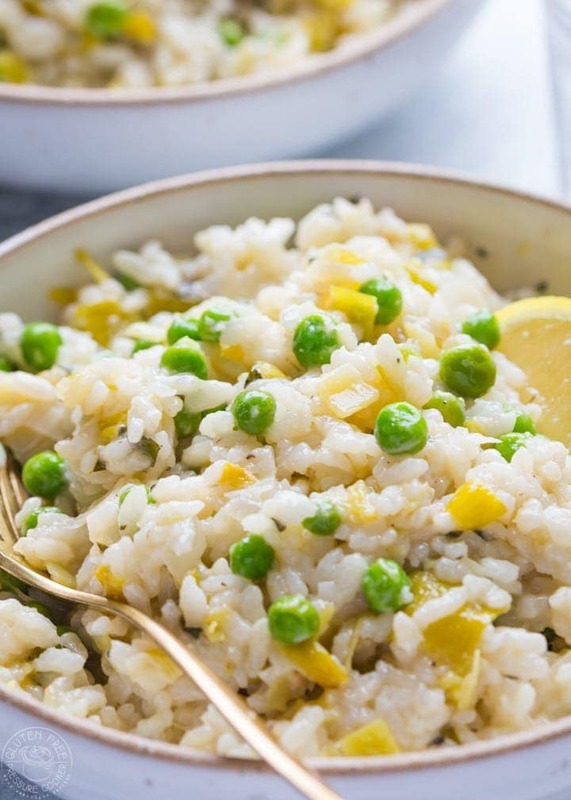 The best rice for making risotto are short grain rice such as Aroborio or Carnaroli. Arborio is the most common one in the USA and easily found in any grocery store. Both those varieties of short grain rice are high in starch which creates a more creamy risotto. Which Wine is best for Risotto? Dry white wine is the best wine for cooking risotto with so you should look for a variety such as Pinot Grigio or Sauvignon Blanc. You don’t need to spend lots of dollars to get a white wine suitable for cooking with, but let me beg you never to use cooking wine, y’all it’s just terrible on so many levels! If you don’t drink wine and won’t use the full bottle then you can buy small packs of mini bottles of wine, or buy a box of wine. What Can I use instead of Wine in Cooking? If you don’t cook with alcohol or simply don’t have any to cook with for this recipe then you can just omit it or add a little more chicken broth and it will cook in exactly the same way. 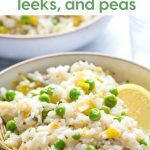 Quick and easy, this Pressure Cooker Risotto with Leeks, Peas, and Tarragon is so easy to make and full of fresh flavors. 1/2 cup dry white wine , Do not use cooking wine! Don't miss the recipe video! you'll find it after the directions. In the inner pot of your Instant Pot or other pressure cooker, turn on the saute function, add the oil and saute the onions and leeks for about 4-5 minutes, stirring frequently. Now turn off the saute function, you don't want the rice to stick to the bottom of the pot. Add the Arborio rice and stir until it begins to turn opaque, about 1- 2 minutes. Turn the saute function back on and then add the wine and continue to cook for a further 3-4 minutes until most of it has been absorbed. Add the low sodium chicken broth to the pot, stir, and lock the lid. Turn the steam release vent to 'sealing' and using the 'manual' or 'pressure cook' setting, adjust it to cook for 5 minutes at High Pressure. It will take about 7-10 minutes to come to pressure. When the cook time is up release the pressure right away (QR, or quick release) and carefully open the lid. Add in the lemon juice, lemon zest, parmesan cheese, salt, pepper, tarragon, peas and butter and stir until the cheese is melted. If you prefer a more soupy consistency to your risotto simply add a little more chicken broth and stir it well to combine. Taste and further adjust the seasoning or add more cheese as desired. Chop the leeks and rinse and drain really well before adding to the recipe, they tend to have sand or grit in between the leaves so pay special attention to rinse all that out. Made lemon risotto in my insta pot tonight was delicious. Used asparagus instead of peas.Excellent recipe,turned out just like picture.This will be my go to for risotto. Thank you! thank you for taking the time to comment and I’m thrilled you love it! I love the idea of substituting the asparagus for the peas, I know that would taste fabulous with the lemon flavors.